Earlier this month we spent a week in the Dordogne. Not surprisingly I took the time to visit Bordeaux, in this case the South part of the Haut-Médoc: in the morning Clos du Jaugueyron (Haut-Médoc and Margaux), and Belle-Vue (Haut-Médoc) in the afternoon. Two adjoining properties producing great (and great value) wines, but with very different approaches. Clos du Jaugueyron is a small property owned by winemaker Michel Théron. With its 5 hectares Clos du Jaugueyron could be regarded as a "left bank garage wine". Not far from the truth actually, because Michel made his first vintages in the garage next to his house in the village of Arsac. 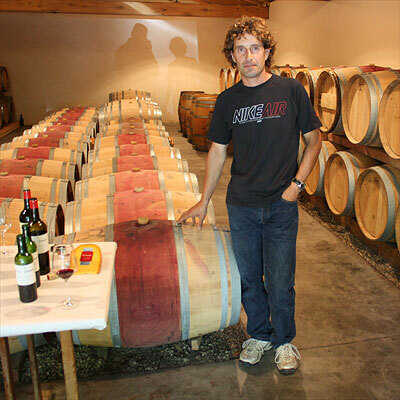 Michel's approach is rather un-Bordeaux so to say: he is both owner ànd winemaker of Clos du Jaugueyron. For most grand Bordeaux châteaux there is an owner who employs a complete team for the production of the wine, the usual roles being: (general) manager, technical director, cellar master, vineyard manager and… external consultant (œnologue conseil). At Clos du Jaugueyron Théron does it all himself. And besides that, he makes honey, great pâté from rabbits that he caught in his vineyard, and other delicious things that − in one or another way − come from the land he owns. I am excited to be the importer of Clos du Jaugueyron. It is a great wine with a strong personality. In the 1,5 years that I have sold the wine it has gained a good number of faithful followers. For your information, this is what Robert Parker says about Clos du Jaugueyron: "Rich, concentrated, perfumed, and impeccably well made. If you can find it, it is well worth buying." 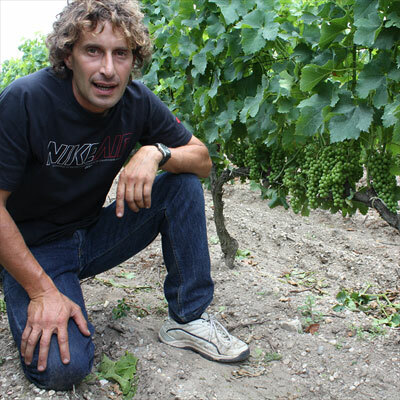 Michel Théron in the vineyard of Clos du Jaugueyron: look how perfect his grapes are lined up! Théron's starting point, as for most winemakers who aim to make quality wine, is to spend most of his time in the vineyard, and spend less time in the cellar. Eye-catching in the vineyard is the way the grape bunches are perfectly lined out along the vines, a direct result of the applied pruning method. The grapes are well exposed after the recent leaf thinning – and as a compensation for 'lost' foliage Théron's vines are allowed to grow high up. See the picture as an illustration to this story. At Clos du Jaugueyron the grapes enter the fermentation vat uncrushed, to produce wines that are fresh and fruit-driven. But the wines need structure too. Racking the wines as little as possible, and thus having it mature on its lees, helps it to gain the desired structure. In the first years in his new and more spacious cellar Théron had the habit of rolling his barrels around, in order to have the lees and the wine mixed. Today, lacking the space to roll, he uses a self-made sort of battonage stick to ensure that there is enough contact between wine and lees. We tasted the Haut-Médocs from 2006, 2007 (just bottled) and 2008 (from vat), and for lunch the splendid Clos du Jaugueyron 2001 Margaux. This rare Margaux is a real beauty. In perfect shape now, very complete and harmonious, classic, fresh, pure and convincing. From the Haut-Médocs I was especially surprised by the appearance of the 2006: already very approachable, and simply delicious – a complete tasting note will follow later. The 2007, in the same style, is somewhat closed now, and seemingly somewhat leaner. Noticable detail: the smokey tone. The 2008 is very promising, with vital fruit and good matière. The 2008 vintage will be the first vintage that is officially organic. In the afternoon I visited Vincent Mulliez, owner of De Gironville, Belle-Vue (Haut-Médocs) and Bolaire (Bordeaux Supérieur, just across the road, the D2). 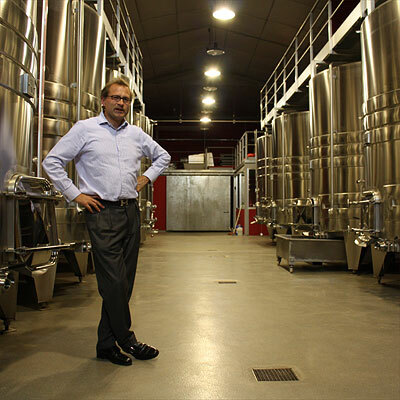 Belle-Vue is established in 1996 when the previous owner Rémy Fouin set apart his best (Gironville) vineyards with the aim of producing a wine of… say Margaux quality: Belle-Vue directly borders the 3rd classed growth Château Giscours. Mulliez joked that it would be a good sign when one day people would describe Giscours "as the neighbour of the famous Château Belle-Vue." But until today this is the other way round, I'm afraid. On my website I describe Mulliez as someone who leaves nothing to chance, and the funny thing was that he used the exact same words when describing their approach: "We leave nothing to chance in the aim to come up with the best possible wine from our terroir." And that can be seen in the investments that are made. For example the cellar looks impeccable. Not over the top, but impeccable. And behind these wines is a full team of experienced people. There is a technical director, Vincent Bache-Gabrielsen (originally from Norway), and a (female) cellar master Marie Perez. Œnologue conseil is Christophe Coupez, director of the Centre d'études et d'informations œnologiques de Pauillac. In comparison to the Clos du Jaugeuyron one could say there is more 'technique' behind this wine, the approach is more academic so to say. Together with Mulliez, who worked in London as a banker, we tasted Bolaire, De Gironville and Belle-Vue from the vintages 2006 up to 2008. Tasting the Bolaire was a confirming experience: a couple of months ago I had picked out this wine as a grand Bordeaux Supérieur. I had tasted and compared many many petits châteaux, many of them uninteresting, but the Bolaire clearly stood out. And it did again. This is a very well made affordable Bordeaux. It has power, grip, ripeness, and good fruit with some sweetness. The Belle-Vue was my favourite. This wine (with over 20% of petit verdot, and for a small part, just like Clos du Jaugueyron from very old vines) is stylish and more polished. A seductive wine, round and ripe, with good grip also, and with a velvet texture. The 2006 and 2008 stood out for me. 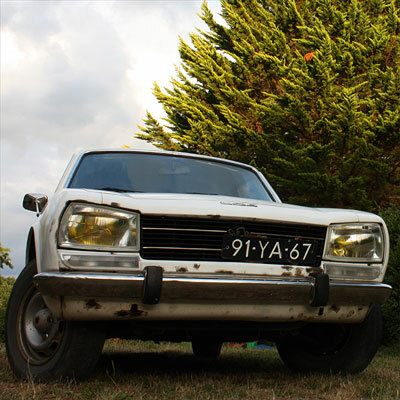 After these very interesting and enjoyable visits I headed back to the Dordogne, driving the 1977 Peugeot 504 from my friend Igor. But not before I made stops in Bordeaux, visiting Jane and Francis Anson, in Saint-Emilion, picking up some wines in the shop owned by Jean-Luc Thunevin, and in Castillon-la-Bataille, eating a delicious Andouillette à l'ancienne. What better way to conclude a great day? Should you be interested in these wines, here they are: www.bolomey.nl.